Fourteen zone control and monitoring device GsmAlarm-220 can be used for protection of houses, apartments, garages, and cottages. In the case of trespass of the protected area GsmAlarm-220, depending on the programmed system operation algorithm, switches the siren on, calls and sends SMS messages to five users. User answers the call using his phone keyboard (DTMF tones), can listen, what is going on in the unit, SMS may be received, informing about the controlled area state, number of each area activation. 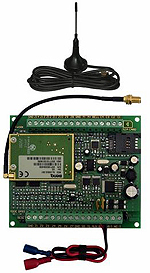 GsmAlarm-220 has 4 (5, if siren is not used) programmable outputs, intended for remote control of different devices. User can turn on/off heating, ventilation or lighting systems etc, by using his mobile phone just by typing a relevant code or sending SMS to the control device. Device works perfect for remote control of automated gates, fences and electromagnetic door locks. In order to open the gate, user calls GsmAlarm-220 number. Then GsmAlarm-220 checks the caller's number in the list of programmed user numbers and in the case of positive find, switches on the gate control device and cancels the call automatically. 250 users are able to control the gate. Paradox Esprit 636, 646 or 642BL keyboards can be connected to GsmAlarm-220. We increase the number of protected zones till 16 by using two keyboards. By using the keyboard users can activate/deactivate full or partial protection mode, turn off armed mode, and configure system parameters. Following keyboard LED indicators you can determine protected unit state, system mode etc. System is turned on or off simply by turning the switch ON/OFF or by short free call if the keypad is not used. The system answers only to the numbers programmed. If the system receives a call, coming not from the user's phone, the call is immediately interrupted and the user is sent SMS, specifying the caller's phone number. SMS messages are also sent to users in case of power loss and restoration. System has temperature measurement possibility. Up to 14 temperature sensors KTY81-110 (PHILIPS) can be connected to GsmAlarm-220 device. If temperature exceeds or subsides programmed range, system sends SMS to user(s), relevant programmable output can be activated/ deactivated. 24 hour timer function enables activation/ deactivation of programmable output and armed mode, receiving SMS messages with guarded object state information on a desired time. You can check alarm operation by short call to GsmAlarm-220 number. If GsmAlarm-220 is operative, the calling user gets a short confirmation call. All GsmAlarm-220 parameters are programmed remotely, by sending SMS with relevant contents with password.